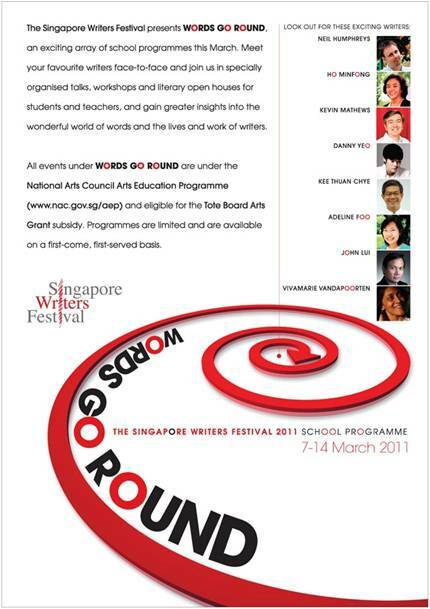 This week, I’m taking part in readings and talks and running workshops for Singapore Writers Festival Schools Programme, ‘Words Go Round’. If I have a moment, I’ll check in here to write about it. So far, a real highlight has been reading and speaking with Sri Lankan poet Viviemarie VanderPoorten – today we gave a talk to a group of students taking a ‘Women in Literature’ A-Level paper at National Junior College. Very interesting to think about how/whether issues of gender creep into my writing, and to be challenged to talk about this. Viviemarie is a truly wonderful and inspiring poet. I’m honoured to read with her, and so happy we’ve met.